The best fantasy football team ever is certainly open to debate by fans of the game. Would Jim Brown start at tailback, or would it be Gale Sayers or Marshall Faulk? One thing�s for sure, however – whether owners participate in a free fantasy football league or play for big money, they all want the next Dan Marino or Jerry Rice on their NFL fantasy football team. And who can blame them? Owning a player during a magical year can fundamentally alter the fate of your fantasy football team. It�s hard for an offensive player to shatter NFL records and not score fistfuls of fantasy points, and this directly translates into win after win for your franchise. So which group of players would make up the best fantasy football team ever? Well, I�ve searched through tons of NFL stats in order to bring you that very answer. A number of the results are somewhat predictable, while other all-time fantasy football rankings will blow your mind. Now let�s take a look at the best fantasy football team ever (at least until next season). Prior to the 2007 season, the Patriots retooled their receiving corps by adding Randy Moss, Donte Stallworth, Wes Welker and Kelley Washington. This paid huge dividends for Brady, as the Pats racked up a perfect 16-0 season and outscored opponents by a margin of more than 2-to-1. Coming into the season, Brady was always known as an excellent quarterback whose fantasy numbers didn�t always live up to his talent. But that would all change in 2007, as the Patriots seemed determined to obliterate teams and keep on passing the ball until the final whistle. Many experts have noted that Brady had the best season ever by a NFL quarterback, and it�s hard to dispute those claims. He threw for 4,806 yards and a record-setting 50 passing touchdowns. He also added 98 rushing yards and a pair of touchdowns on the ground. This gave him a total of 513 fantasy points, beating out Dan Marino�s legendary 1984 season (5,084 yards, 48TD) by a 22-point margin. San Diego Chargers became the fastest player to score 100 career touchdowns (surpassing Jim Brown and Emmitt Smith), as well as the first player to score four or more touchdowns in three different regular-season games. During one stretch in 2006, LT2 racked up a mind-blowing 19 touchdowns within only six games. He finished the NFL regular-season with 1,815 yards rushing and a record-setting 28 touchdowns. Tomlinson added 508 receiving yards and three touchdown receptions, and he also demonstrated his versatility by passing for 2 additional touchdowns. This gave him 417 fantasy points for the season and the title of the greatest single-season fantasy running back ever. Following the season, Tomlinson�s efforts were awarded with the NFL Most Valuable Player Award. He was voted to the Pro Bowl and also received the Walter Payton Man of the Year Award. The following July, he even took home three ESPN ESPY Awards (Male Athlete of the Year, Best Record-Breaking Performance and Best NFL Athlete). Priest Holmes started his NFL career with the Baltimore Ravens in 1997 as an undrafted free agent. Much of this was due to his lack of playing time in college, as Holmes was behind Ricky Williams on the University of Texas depth chart. Holmes busted out in 1998, but inconsistent play caused him to be replaced by Jamal Lewis in 2000. The following season, he signed a contract with the Kansas City Chiefs and went on to lead the league in rushing. He followed that up in 2002 with 1,615 rushing yards and 21 touchdowns, but it would pale in comparison to his 2003 campaign. First off, Holmes broke the NFL record for total touchdowns by scoring 27 on the ground (Marshall Faulk has previously held the record). He also pitched in 1,420 rushing yards and 690 receiving yards (off of a team-high 74 catches). This allowed him to finish the season with 373 fantasy football points, which is enough to make him one of the starting tailbacks on the best fantasy football team ever. He beat out Shaun Alexander�s 2005 season by 10 points and Emmitt Smith�s 1995 season by 9 points. After an impressive seven-year career with the Minnesota Vikings, Randy Moss was traded to the Raiders and promptly dropped off the radar. When he ended up with the Patriots for the 2007 season, fantasy owners were hopeful but cautious, and Moss slid down most fantasy draft boards. When the season started, Moss exploded on the field and made fantasy owners everywhere pump their fists in excitement. As the Patriots worked on going undefeated, Moss had eight games with multiple touchdowns and was held without a score in only three regular-season games. In week 11, he torched the Buffalo Bills for 10 catches, 128 yards and 4 touchdowns. Moss finished the 2007 season with 1,493 receiving yards and 23 touchdowns (breaking the record formerly held by Jerry Rice). This gave Moss a total of 287 fantasy points. His presence alone was enough to propel many fantasy teams into the playoffs, and the combination of Moss and Brady should have owners drooling in anticipation for many seasons to come. Coming off a Super Bowl win in 1994, the Niners and their fans were looking forward to another big year; Jerry Rice did not disappoint. The 13-time Pro Bowler caught a career high 122 passes for 1,848 yards and 15 touchdowns (including touchdowns by running, passing and recovering a fumble). This performance was, to date, the greatest ever turned in by a fantasy football wide receiver. His reception yards from 1995 still stand as a NFL record, and the always-accurate Steve Young also deserves a significant portion of the credit. 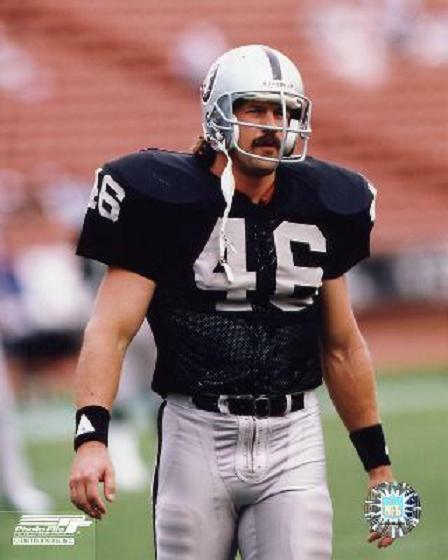 Rice would later be voted to the NFL�s All-Decade Teams for both the 80s and 90s, and he would achieve success in the twilight of his career with the Oakland Raiders. But no matter where he played, you could always count on Jerry Rice being taken high in fantasy football drafts across the country. When I was looking up the stats for the greatest fantasy football tight end of all time, I expected the honor would go to someone like Tony Gonzalez or Antonio Gates. Instead, it ended up being Todd Christensen, a player who started four years at running back for BYU. Oakland Raiders, who were at the time playing in Los Angeles. In 1983, he responded by catching 92 passes for 1,247 yards and 12 touchdowns (and leading the NFL in receiving). This was good enough for the top fantasy tight end ranking, beating Tony Gonzalez�s 2000 season by 22 points. Christensen would appear in five Pro Bowls, and he moved into television work following his retirement. In fact, younger NFL fans might be more familiar with Christensen from his days working as co-host of the original American Gladiators program. While he�s also worked for NBC and ESPN, owners from the early days of fantasy football will always remember Todd Christensen as an all-time great. When it comes to fantasy football kickers, there�s something to be said for an offense that�s good enough to move the ball down the field but not good enough to get it into the endzone. Neil Rackers benefited from such an offense in 2005, as the Cardinals played musical chairs with quarterbacks Kurt Warner and Josh McCown. While he chipped in 20 extra points, Rackers really excelled when his teammates failed to move the ball across the goal line. He made 11 field goals from between 20 to 29 yards, 10 from 30 to 39 yards, 13 from 40 to 49 yards and 6 from 50 yards or greater. By our scoring system, Rackers racked up 158 fantasy points during the 2005 season. His 40 field goals during the regular season currently stands as a NFL record. While the Steel Curtain Defense of the Steelers certainly had bigger stars, the 2000 Ravens defense is the only squad in NFL history to hold opposing team to fewer than 11 points per game (on average). They only allowed 165 points during a 16-game season, and they recorded four shutouts along the way. The team finished 12-4 and went on to win the Super Bowl, despite the fact that the offense went five straight games without scoring a touchdown. Ray Lewis was named NFL Defensive Player of the Year, and he was joined at the Pro Bowl by fellow teammates Sam Adams and Rod Woodson. This one might be spotty for some fantasy leagues, because the scoring system for defenses are so different. My main local league hugely weights scoring to points allowed. Since the 2000 Ravens Defense gave up less points than any other NFL defense in a 16-game season, I have to give them the nod. If you get more points for turnovers and defensive touchdowns, the ’85 Bears Defense might be the way to go here.